Downtown Development By the Numbers - Downtown Phoenix Inc.
We’re known for our music scene. But if you’ve walked around Downtown Phoenix lately, you’ve probably heard a different kind of symphony — power tools, hammers and nail guns mixed with the steady hum of earthmoving equipment. Industrial cranes dance across the sky while highly-choreographed teams build marvelous new structures and rehabilitate old ones. 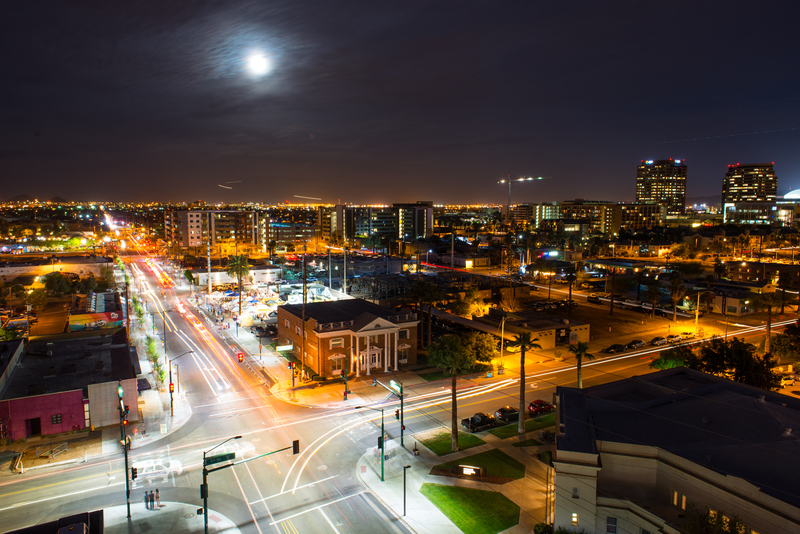 Downtown Phoenix is in the midst of a development boom. Projects like the Biosciences Partnership Building, Arizona Center for Law and Society, Union @ Roosevelt, the redevelopment of Luhrs City Center (and many more) provide evidence of a growing interest in Downtown Phoenix. Currently 1.2 million square feet of commercial construction is underway, including 600 hotel rooms and 650 residential units. According to David Krietor, president and CEO of Downtown Phoenix Inc., the immense growth reflects the vibrancy, diversity and complexity of a changing urban center. Over the past 10 years, downtown recognized $4.6 billion in the areas of transportation, education, research, real estate, arts, culture, sports and hospitality. The fruit of that labor is finally paying off according to Dan Klocke, vice president of development for Downtown Phoenix Inc.
Based on U.S. Census data, a growing number of millennials and baby boomers are looking to settle in urban centers close to work, school or just near the action. Developers are now rushing to fill that demand, according to Klocke. In addition to a growing population, successful past projects laid the groundwork to support the current influx of new apartments and condominiums. Downtown currently boasts 800,000 square feet of retail space, 8 million square feet of private office space and 170 restaurants. Arts, culture, theater, sports and community events are also stronger than ever, with more than 6 million attendees annually. One million people visited downtown during Super Bowl XLIX alone. In the past, there were just not enough people willing to invest here, according to Krietor. But now, downtown finally has the numbers, the interest and the infrastructure — and the timing couldn’t be better. Click here for more information about business and economic development in Downtown Phoenix, or contact us.